Preheat oven to 350 degrees F. Line an 8x13" baking pan with parchment paper and set aside. Toast oats, almonds and flax on a sheet pan for 12-15 minutes, stirring halfway through until lightly browned. Reduce temperature to 300 degrees. In a microwave safe bowl, combine honey, brown sugar, butter and salt. Heat in microwave until combined (my microwave takes about 2 minutes). Place the oat mixture in a large bowl and add the honey mixture. Mix until incorporated. Add dried fruit and gently mix again. 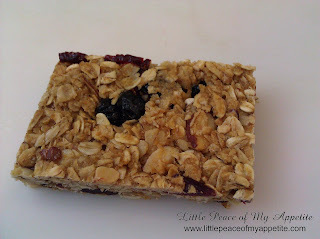 Pour the granola mixture into the parchment-lined baking pan. Using wet fingers, press firmly into the pan until evenly distributed. Bake for 25-30 minutes until light, golden brown. Allow to cool for 2-3 hours then cut into 16 bars. Wrap each bar in waxed paper and store in a ziploc bag.